I couldn’t resist. Yes, this post is about the Chia Pet (random, I know). 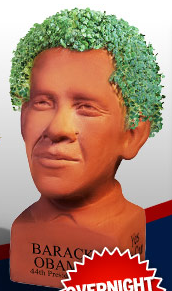 For the holiday season, the company has made a Chia Pet out of the President. Quite frankly I’ve always wanted one just because it’s such a novel way of getting into horticulture. Okay, so that’s not exactly true but the prospect of plant and sculpture all-in-one is pretty neat. A bonsai tree is so much work but that’s the plant I really want! Notes on metamodernism is a webzine documenting trends and tendencies across aesthetics and culture that can no longer be understood by a postmodern vernacular but require another idiom – one that we have come to call metamodernism. Written by academics and critics from around the globe, Notes on metamodernism features observations on anything from the Berlin art scene to US cinema, from London fashion shows to network cultures. I do a lot of exploring in the virtual landscape. My evenings are spent reading, writing, and discovering new artists, writers, and theorists. Sometimes, I run into virtual spaces I’m convinced were created just for me (okay, okay, that’s a bit selfish to say but you know what I mean). Notes on Metamodernism is an online zine for artists, writers, and bloggers who thrive on critical theory and thinking. Definitely worth your time if you’re interested in this type of writing (and reading)! After reading an interview with creator of Colossal: Art & Design blog, Chris Jobson, on Hyperallergic, I have a bit more perspective on how to shape my blogging and art writing for the new year. It’s a relativitely short interview and quite informative if you’re looking into creating and building your own virtual space. I’m also taking a few days off from posting the heavy art musings since I’m working on a few pieces at the moment that require all of my brain cells!